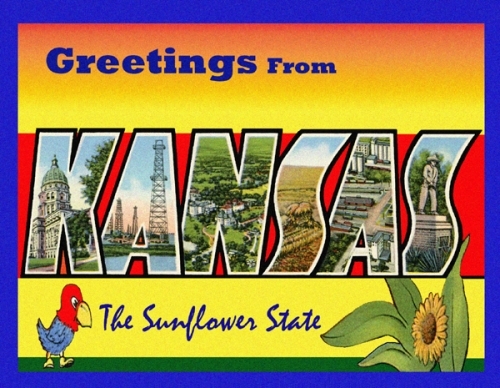 Greetings From Kansas Postcard - Custom original only available at Legends' General Store. Text on back: Kansas has many claims to fame, including a long history of pre-Civil War battles when it was first labeled the "Free State," as well as unparrelled Old West legacies in its many cowtowns, Native American history, and along the historic westward trails. Though most perceive Kansas as being "flat as a pancake," it actually rises in elevation some 3,300 feet from the Missouri border to the Colorado border, and off the beaten path, can be seen hills and valleys, unique rock formations, and six scenic byways.